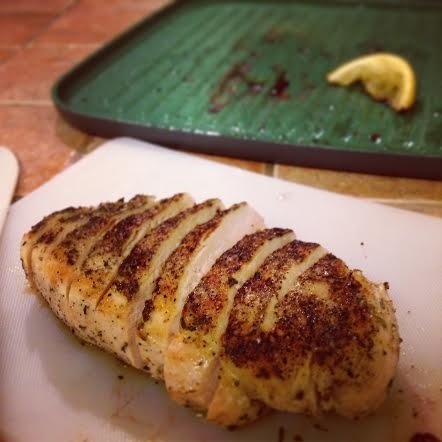 Always have a perfect chicken breast! Great to prep ahead for the week, or to cook in a jam! Preheat oven to 350 and get a saute pan nice and hot with a little bit of olive oil. Season one side of chicken breast with salt, pepper, Italian seasoning and garlic powder. Place the chicken seasoned side down on the hot pan. Should make a searing noise, otherwise pan isn't hot enough! While one side is cooking, add the same seasonings to the other side. Right before you flip the chicken breast, squeeze a wedge of fresh lemon into the pan, leaving the rind in the pan next to the chicken. Flip and put the chicken in the oven to finish off. after 8-10 minutes remove chicken. Let it rest a minute before slicing. Color shouldn't be pink, and if you have thermometer, internal temperature should be at 165!